The bustling streets of Barcelona can seem like controlled chaos during the peak tourist months. Troves of tourists flock to the streets of Barcelona to see the sites, taste the food and bask on the beaches. Drawing in travelers, is its rich, medieval history, with some of the best food in the world and unique Catalan culture. After all, the famous Antoni Gaudi used the streets and neighborhoods of Barcelona as a living canvas for some of his greatest and most celebrated architectural works. When on vacation you probably want a healthy mix of popular and off the grid experiences to make for an unforgettable experience. Here are five of the best off the beaten path tourist spots in Barcelona where you can still get the Catalan experience, but feel more like a local. La Rambla, 58, ppal 2. What happens when three food-enthusiastic friends come together in Barcelona for the love of gastronomy? A cooking school is born! Barcelona Cooking was established to give locals and tourists a unique, local perspective into the classic and creative cooking styles found in the Catalan region. From classes to market tours, Barcelona Cooking works together with local farmers to support their community and provide an experience that is truly one of a kind. Barcelona Cooking takes a “farm-to-table” approach when selecting seasonal ingredients from the city’s popular La Boqueria market, in the heart of Barcelona. The owners and staff have thoughtfully designed four different courses from the all-inclusive Catalan tapas, wine and La Bouqueria tour to a classic Spanish cooking class—there is something for everyone! Skip the long lines and expensive rooftop tours at the Barcelona Cathedral and trade it for a breathtaking experience at La Basílica dels Sants Màrtirs Just i Pastor. This lesser known “tour” is more of a self-guided experience through a gorgeous basilica located within the winding labyrinth alleyways of Barcelona’s Gothic Quarter. Understated on the outside but breathtaking architecture on the inside, it’s worth the GPS quest to find this quiet place. Even better, for just 2 Euros you can take yourself up the steps to the roof and even higher to the ancient bell tower to see some of the best views inside the city. At any other chapel or basilica you would pay anywhere from 8-15 Euros only to be ushered out with the crowds, but here you are almost always the only rooftop dweller and can take all the time you please. Break away from the groups and take yourself on a self-guided tour through districts like El Born, The Gothic Quarter and through La Ramblas. Self-guided bike tours offer you the chance to do a little research beforehand, pick the spots you want to see and move at your own pace! If you are in Barcelona for longer than the weekend, pick a day other than Saturday or Sunday to tour or start your weekend adventure early to beat the sleepy crowds that come out around 11 am. If you are dying for more city views or a relaxed place to hang out with friends without the crowds going to Castle Montjuic, El Carmel Bunker is a lesser-known spot to snap a few shots of the city. In addition to beautiful views, “The Bunker” has a violent history dating back to the Civil War. It was renovated in 1937, and by renovated I mean metal shrapnel and gaping holes were covered—it is by no means a destination that is regularly tended to, and you will need to hike up the hill known as Turó de la Rovira to get there. Old firing platforms are now used as places to sit, and atop the hill you will feel like you’ve just unsheathed one of Barcelona’s best kept secrets. Take the liveliness of La Ramblas, take out the crowds and add quaint shops with cheap drinks and you’ll be left with the El Born district. Lesser-known by tourists but frequented by locals, this area is the perfect spot for a leisurely stroll through the Barri Gotic streets that mimic the Gothic Quarter but without the long lines of tourists and guided tours. The very essence of Barcelona can be found in this eclectic neighborhood full of little treasures and lesser-known sites. Once a site for jousting matches, the square of Passeig Del Born is home to the Santa Maria Del Mar church that towers over the district with stacked gothic towers and beautiful stained glass inside. Other treasures within the El Born district include the Chocolate Museum, the famous Picasso Museum and the Palace of Catalan Music. 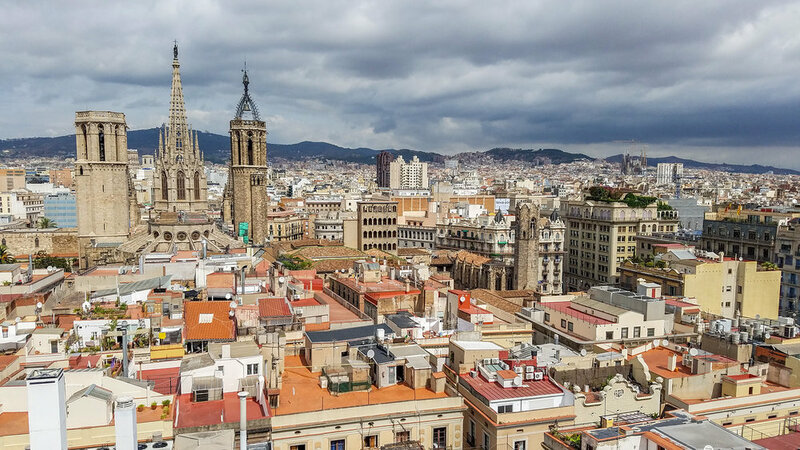 No doubt this area is both welcoming and forthcoming for new and upcoming hot spots in Barcelona as well as well-preserved, ancient sites that serve as a perfect backdrop to a romantic evening or afternoon stroll. Barcelona may be by the sea, but you don’t have to eat seafood to enjoy the Catalonian capital’s food scene. Don’t miss these vegetarian-friendly restaurants. Bookmark these sustainable coffee shops for your trip to The Big Apple.